Sunderland will take a 2-1 lead to Old Trafford on January 22, and a realistic chance of reaching their first cup final in 22 years. A Ryan Giggs own goal and Fabio Borini’s penalty, either side of Nemanja Vidic’s header means the Black Cats only need a draw at the home of the increasingly forlorn-looking champions. With manager David Moyes yet to win a major trophy and Manchester United struggling so badly in the other competitions, the Red Devils will be under intense pressure in the second leg. Sunderland, just hoping to avoid relegation, will not. It was a third straight defeat for the champions and yet another impressive scalp for a Black Cats who seem to rise to the big occasions, despite being officially the worst team in the Premier League. A Gustavo Poyet substitution made the difference once more, Adam Johnson leaving the bench to provide a decisive cutting edge his team and the game as a whole had been missing. Not helped by all the empty seats for Sunderland’s third home game of a year only seven days old, the first half had been fairly tepid until Sebastian Larsson’s deep free kick in added time created the opening goal. Inevitably it was created by two ex-Manchester United players, although the final touch came from Giggs. Sunderland had three in their line-up, as opposed to the two ex-Black Cats in the opposition and it was Wes Brown, possibly from an offside position. Under pressure from Phil Bardsley, Giggs put through his own net. In open play Sunderland had been guilty of not getting enough bodies into the box, despite their patient football leaving plenty of time for it. Debutant Marcos Alonso twice put in crosses worthy of a goal, only to be disappointed. The first, after nine minutes, was his first meaningful contribution in a red-and-white shirt after his loan move from Fiorentina. Having laid the ball off to the Spaniard, Steven Fletcher was unable to get on the end of it. He was the only home player in the penalty area. It was a similar story when Ki Sung-Yeung picked Alonso out with a good pass. This time Fletcher was running onto the ball, but could not direct it. Alonso’s only lapse of the first half came when he allowed Luis Antonio Valencia to skip past him, but again the low centre passed dangerously across the area without a touch. The Black Cats had started the better, although there was not enough end product to their football. Fabio Borini shot wide after reacting first to Jonny Evans’ stab at the ball and Larsson volleyed into the centre-back in the opening quarter of an hour. When the first save of the game came, Vito Mannone made it, although Danny Welbeck’s 18th-minute curled shot from outside the area was hardly challenging. He later missed the target attempting a repeat. Even at 40, Giggs looked Manchester United’s best bet, and his strike hit the bar after flicking off John O’Shea. At the other end of the age scale, Adnan Januzaj had a couple of efforts, and the one Bardsley headed away looked goalbound, while Vidic headed wide at a corner. Moyes’ early Manchester United career has been a story of two steps forwards, one back, but this time it was to be the other way around, Sunderland taking the lead on the stroke of half-time. It sparked a far livelier second half. The Red Devils needed just seven minutes to equalise. Emanuele Giaccherini handled, and the visitors forced a corner. From it, Nemanja Vidic powered over Brown and O’Shea, headed in and pumped the air. Sunderland would really like the trophy but the Red Devils need it, something that might be played on in the second leg. Giaccherini was quickly removed, former Manchester City winger Adam Johnson introduced in his place. It seemed to inspire him. Larsson forced the first really good save of the night, shooting from a tight angle, before Johnson made his mark. Tom Cleverley got in a tangle as Johnson ran at him and although the contact looked to be just outside the area, Andre Marriner pointed to the penalty spot. Borini’s penalty went high into the net. Johnson was soon tormenting him again, running past him and Michael Carrick before firing over. Cleverely was soon substituted. Booked for protesting about the penalty, a minute later Rafael Da Silva was lucky not to imitate his brother Fabio’s red card of two days earlier. Marriner looked kindly on his late challenge on Borini. Inevitably a period of pressure followed from the men in the dark blue shirts, but Januzaj kept missing the target, albeit often only narrowly. The teenager of a thousand passports had a first-half goal disallowed for offside when his shot turned into a one-two off the unwitting Giggs, and no matter how hard he tried, he could not find the net again. One effort curled inches wide, another floated onto the roof of the net as he ran onto Valencia’s cross. Patrice Evra forced his way though but shot wide, Welbeck’s header lacked conviction and Carrick’s added time shot had plenty of power but missed the target. Poyet went ballistic on the touchline at the news that a minimum of five minutes were to be added but he need not have worried. Sir Alex Ferguson was in the director’s box, not the dugout, and without him the late equalisers are no longer an inevitable, more an improbability. Bookings for substitutes Chris Smalling and Darren Fletcher had hinted at the visitors’ desperation. 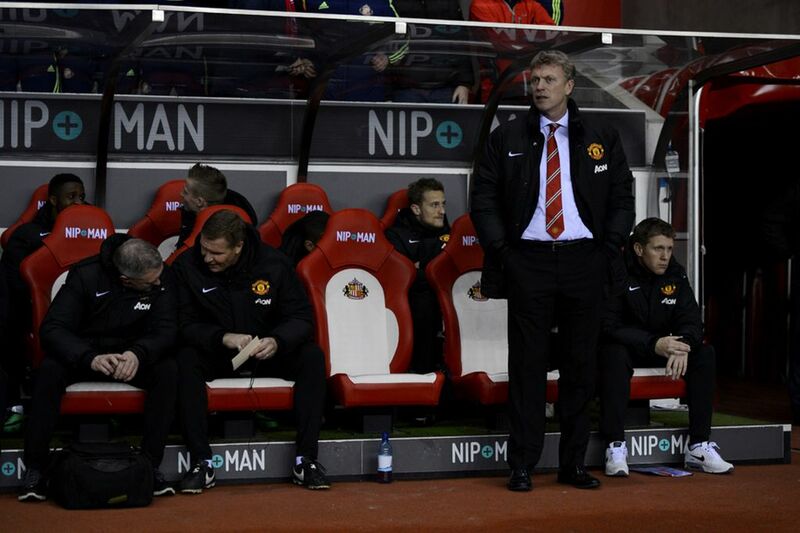 Moyes slumped in his seat muttering at no one in particular. Alonso produced a magnificent defensive header in the final five minutes, Bardsley a sliding tackle on Welbeck to lift the crowd’s spirits and volume. Ferguson, Bryan Robson and Sir Bobby Charlton cut disconsolate figures as the cameras panned on them at full-time. The Scot has suffered bigger disappointments than this, but the side Moyes has inherited does not appear to have the same ability to bounce back from them. Sunderland still could do with a striker like John Byrne, who fired them to the 1992 FA Cup final, but Wembley is in sight.